Moose Hollow Condo 602, this is a 2 BD / 2 BA TOP FLOOR with views....the perfect cozy condo for a ski trip or summer getaway year round. It's also right next door to the Wolf Creek Resort Golf Course. You're minutes from 3 ski resorts Nordic Valley, Snowbasin and Powder Mountain. 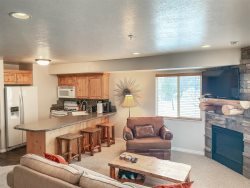 This condo has great valley views from it's balconies as well as the main Moose Hollow HOT TUB and swimming pool are directly across the street - you couldn't be any closer. There's a fully outiftted kitchen with everything you'll need to cook, just hit the grocery store on the way in. There's complimentary WIFI (high speed internet), gas fireplace, TV's with Dish Network. Kitchen has plenty of seating. All Moose Hollow guests also have access to the Moose Hollow clubhouse work out facility, swimming pool, kids game room and hot tub at no daily fee charge - 100% complimentary. All new set-up here too....new glasses, dishes, pots, pans, utensils, etc...full decorated in a modern rustic decor. Please, NO PETS and absolutely NO SMOKING. Also must be 25 feet from building to smoke (HOA rules). This unit was very comfortable for my husband and me and adult son. I really liked that bedrooms are on different floors. The kitchen was awesome and had everything that we would need and more. It was very conveniently located across from the rec center and pool and hot tub. I liked the lotions and soaps from local vendors like simply eden. It was a very nice unit and I would recommend to others. 50% of total rental rate is due at the time of booking as a deposit to hold property. The balance on the account is due and payable 30 days prior to arrival. All reservations are subject to a cleaning Fee and taxes. A credit card is required for possible damages. Check-in time is 4:00 p.m. A early check-in may be arranged dependent upon availability and must be arranged ahead of time with booking agent. Check-out time is 11:00 a.m. A late check-out may be arranged dependent upon availability and must be arranged ahead of time with booking agent.